Over the past three decades of installing, servicing, and monitoring stretch equipment and film application, we’ve seen what works (and what doesn’t) to keep a load intact and the products protected along their journey. We’ve seen trends in business goals ranging from “get it shiny and ship it,” to unit cost and sustainability. And we’ve seen reductions in primary and secondary packaging that had – and are having – significant impacts on the end-of-line packaging success. Given what we’ve learned through all of this, we knew that sharing our insight would help customers make educated decisions as they adapt to a changing marketplace. We’ve been able to do this through a couple unique programs. Ten years ago, we launched MUST, a hardware and software system that monitors stretch film application to spot correlations with film breaks and the amount of film applied, number of revolutions, tension settings, and roll changes. Our technicians set a benchmark and the MUST system monitors performance, alerting us when a stretch wrapper is operating outside the designated safe area. This helps us communicate with our customers when, why, and how a wrapper is out of spec. We also launched Stretch University, a training session that educates our customers about the science of stretch film and stretch packaging. In 2017, we brought these elements together along with highly advanced testing that we’ll be rolling out later this year to make up the MUST Method, an approach that’s defining the standard in stretch packaging. To introduce this testing and bring the whole program to the next level, we’ve teamed up with Lansmont, the leaders in vibration and impact testing equipment for industries that include aerospace, automotive, and electronics. Lansmont has established their reputation as the go-to company for testing. Since 1971, they’ve been designing and building testing equipment to help engineers measure hazards in the field and then use those measurements to test for product vulnerabilities. 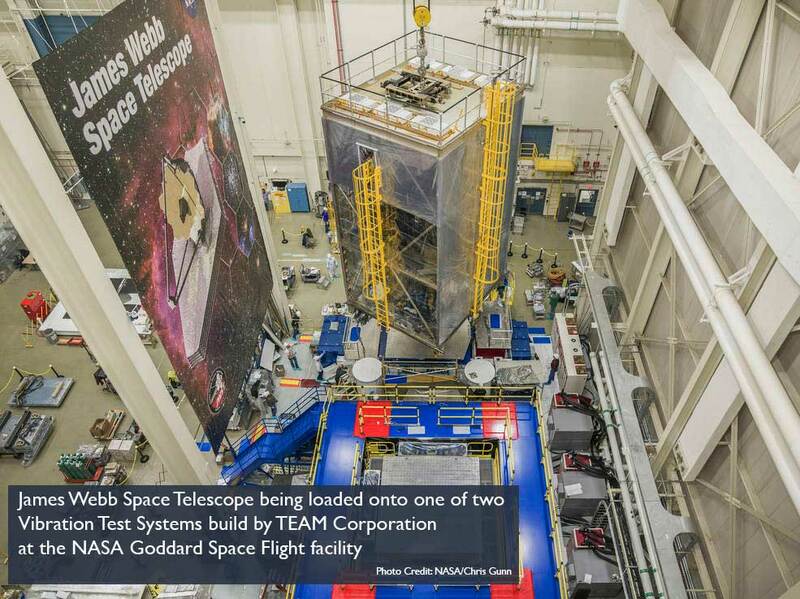 As part of the NVT Group along with TEAM Corporation, their equipment is currently being used by NASA for vibration testing on the James Webb Space Telescope at the Goddard Space Flight Center in Greenbelt, Maryland. NASA also performed vibration testing on the Orion Service Module at Glenn’s Plum Brook Station using equipment built by NVT Group that is today’s most powerful spacecraft shaker system. When Atlantic wanted to introduce high level testing to advance our knowledge in effective stretch packaging, we went straight to Lansmont. Because of our investment in the science of stretch wrapping, we understand how the film and machine settings work together to create the ultimate balance of product protection and material efficiency. This means that our customers can prevent product damage in transit while using the least amount of film possible. But because every application is unique, we need a way to find that exact combination – or standard – for each type of load. The only type of vibration testing equipment we’d seen in the marketplace was limited to vertical up-and-down vibration. In real world transit, vibration occurs at various angles. With Lansmont’s TruMotion™ multi degree of freedom test system along with their field data recorders, we found a system that would accurately reflect these movements, and a partner that understood exactly what we were trying to do. Because more emphasis is being placed on stretch film and pallet wrapping to protect products, it’s critical to examine gauge, tension, prestretch, revolutions, and wrap patterns to make sure the applied film can handle the load effectively and efficiently. Our work with Lansmont gives us the most advanced tools possible to test, refine, and prove out the standards we set for our customers. 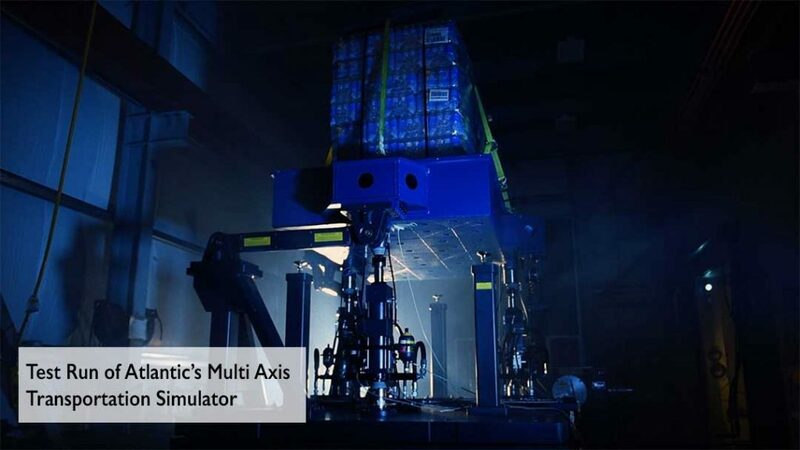 Atlantic’s Multi-Axis Transportation Simulator being built by Lansmont is the first of its kind in the packaging industry. In conjunction with field data recorders that track real-world transportation data – including pitch, roll, and yawl – the simulator will re-create specific vibration profiles in the lab environment of our Packaging Solution Center. If one of our customers is experiencing damage to products during transit, we can re-create that trip in the Center to see where and how their products are failing and devise a wrapping solution to prevent that event from happening again. Lansmont and Atlantic share a common vision for creating a brand-new model in the packaging industry, one that is based on scientific testing to eliminate guesswork, creates real standards, and gives customers the confidence that their loads are Fit2Ship.